Every pundit and journalist have already given their analysis of the Romney-Obama debate, so I won’t go into a lengthy piece about. 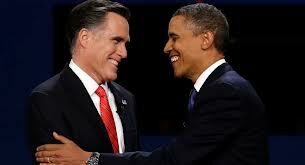 Majority of viewers agreed Romney looked presidential while Obama appeared tired and disconnected from the debate. I’ll simply share my snarky review of the debate through a compilation of tweets I issued during Wednesday night. Enjoy! All I heard from Obama tonight was inheriting Bush’s problems & about Bill Clinton. Hey @stefcutter and @davidaxelrod, where is the FORWARD? Barack Obama’s campaign needs an heavy injection of political steroids in order to survive til November. Can you be of help@JoseCanseco? Romney may have referenced Big Bird tonight, but he was straight-up Shredder from TMNT tonight! I must agree with everything you have said here, Romney looked prepared and pumped, Zero-bama looked tired and babbled several times, someone really should tell Zero that the debate is different than the campaign, “the puppet was without his strings” last night……..